Having a bulb go out in one of your pool lights can be frustrating—especially if your first thought is that you’re going to need to drain the water from your pool in order to safely access and replace the bulb. In reality, most pool lights and bulbs are designed to be easily replaced without the need to drain any water from your pool, so replacing a bulb in your pool really shouldn’t take much longer than replacing any other type of bulb in your home or on your property. Still, before you tackle this project, it’s a good idea to read through these steps so that you know how to safely replace a pool bulb. It’s best to have a licensed pool technician perform this replacement, but if you are going to tackle this yourself, read the instructions below. The first step you’ll need to take is to purchase the right replacement bulb and gasket for your pool light based on the existing bulb and gasket. 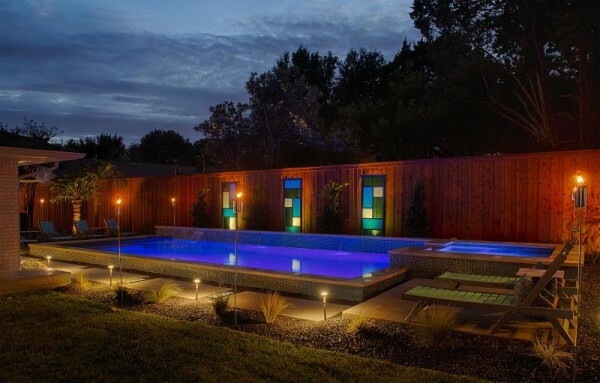 Unfortunately, there are many different types of pool lights, and you could put yourself and others at risk of electrical shock by installing the wrong one in your existing pool. Never replace a bulb without a new gasket. The easiest way to find out what type of bulb you need is to check the information that your pool builders left you. From this, you should be able to find information on the manufacturer, model number, voltage, and wattage of the bulb. If you can’t find this information, you’ll need to wait until you can remove the existing bulb from the pool to get that information from the back of the light housing itself. This will require you to move on to the next step. To protect yourself from electrical shock, be sure to completely shut off the power to your pool light before moving forward with the bulb replacement. Some pools may have their own dedicated breaker box, whereas other pools may share a breaker box with the rest of your home. Either way, find the switch that controls your pool lighting and shut it off. With electricity to the lights shut off, you should now be able to safely remove the light fixture from the niche in the side of your pool. Depending on the type of light fixture you’re working with, this might require you to use a flat head screwdriver or another type of handheld tool. Once the fixture is removed from the niche in the pool, there should be enough wiring behind it that you can pull the fixture up to your pool deck, remove the lens cover, and unscrew the bulb. Never try and replace the bulb in the water. If you haven’t yet purchased your replacement bulb, be sure to take the burnt-out bulb and gasket in with you so you know exactly which type to buy. You might want to consider stocking up on these lights and gaskets. Once you have the replacement bulb and gasket, go ahead and screw it in and reinstall the lens cover. Once you’re done installing the fixture back into the niche, making sure the cord is pushed in properly, go ahead and restore power to the breaker that controls your pool lights. You should now have working lights throughout your pool. You’ll also want to check and make sure that no air bubbles are coming from the light that you have replaced, as this could indicate that the gasket was not installed correctly. If you see any air bubbles, shut off power again and try re-installing the gasket. When you are re-installing the fixture be careful to line up any and all screw holes or tabs properly. As you can see, replacing a burnt-out pool light bulb doesn’t have to be a difficult task. The main thing is to make sure that you purchase the right replacement bulb and gasket, and to ensure that electrical power is shut off to your pool lights before moving forward. But, again we suggest always using a licensed pool technician to perform this task. Working pool lights allow you to enjoy your swimming pool even when it’s dark out, so it’s a good idea to keep replacements on-hand. For more information on maintaining your swimming pool, contact the team at Summerhill Pools today.